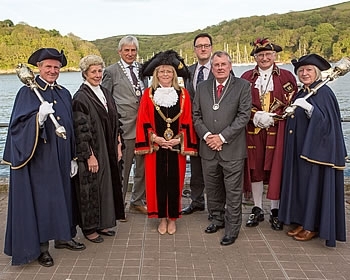 Six years ago when Ruth became a Councillor on Fowey Town Council she possibly did not envisage herself becoming Mayor. She has had 12 months 'practice' by being Deputy Mayor during 2014-15, a role she performed exceptionally well especially during Cllr. Berryman’s extended holiday of three months during his last term of office as Mayor. Although not a 'local girl born and bred' (she hails from Northumberland), she and her husband Paul have lived in Fowey for 25 years raising their family of three here, with Ruth teaching at Fowey Academy. Whilst the girls are spreading their wings, their son has achieved an Apprenticeship with Fowey Harbour Commission. Paul, also a teacher, retired recently from his profession but as any Retiree, never has a minute. Whilst Ruth was at Bangor University she studied history and archaeology and her love of Fowey and its’ amazing history comes through whatever task she takes on, from refurbishing the Old Grammar School Gardens to creating an orchard in the new allotments, using a mix of old Cornish variety apple trees. Ruth’s project of the moment, however, is the Fowey Parish Neighbourhood Plan which will give you, as residents of Fowey Parish, the opportunity to have your say on the way forward. In the photograph her husband Paul, her Consort, is on the right, and Deputy Mayor, Cllr. John Berryman is on the left. To the right of Paul stands Town Crier Michael Penprase and Mace Bearer Cllr. Mrs. Lesley McCartney, with the Rev. Philip de Grey-Warter behind. On the left of Cllr. Berryman is Town Clerk Mrs. Sally Vincent JP and Mace Bearer Andy McCartney.